The resolution and details are less good than what you would get if you bought a miniature in a store. And you can't print very thin parts without the result being extremely fragile. That is why for the skeletons in the above picture I chose a model with a solid ribcage. 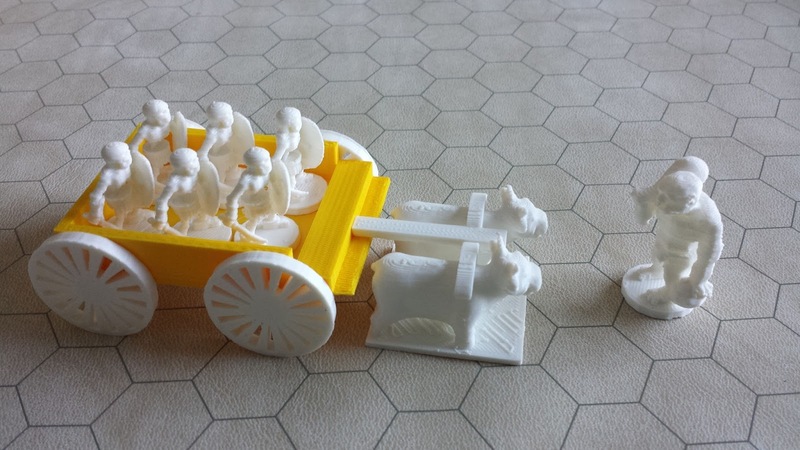 I can make simple structures myself with TinkerCAD: For example the ox in front of the cart have been created by somebody else, but I added the yoke. I also created the cart, while taking the wheels from Thingiverse. Basically the surface becomes rougher than with the opaque PLA, and gets an aspect as if you had coated it with crystal sugar. That *can* look quite good, I quite like my green dragon. However the material is even more fragile and brittle. Assembling the dragon was very difficult, because the surfaces that needed to come together weren't smooth, and needed a lot of work with a knife and sandpaper. And I'm not sure I'll be able to bring the result elsewhere without shattering it during transport. Miniatures with some surface structure (like the bones on the skeletons) become less visible with the clear PLA than with the regular one. Unfortunately certain colors like red and green *only* come in clear PLA for this model of printer. Hi Tobold thanks for the photos, I was very curious. What can I say: I wasn't expecting something spectacular but in all honesty I didn't even understand those were skeletons :-(. The dragon model is decent from distance (thumbnail) but as soon as I clicked the image... Oh boy it looks so bad, unfinished and -as you said- sugar-coated. Maybe those models are too small for 3D printing? I don't know, the skeletons and the ogre look like you made them with snow :-( and the overall "finish" quality is extremely poor in my opinion. I understand you can print large quantities for a low price per piece but... Is it really worth it? Sorry to disappoint you, but the larger things you print don't get much better either. Thus all my previous posts on the subject of 3D printing saying that it isn't all that useful. But my specific niche application is using these figurines as tokens in a game. 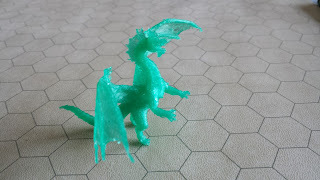 If there is a fight against a dragon and his kobold minions, the players just need to be able to recognize which of the tokens is the dragon and which are the kobolds. That is a very low bar to reach. The printed miniatures, ugly as they are, are fit for purpose and somewhat better than the flat tokens I used before. If I wouldn't have that specific niche application, I wouldn't really know what to use that printer for. I agree that neither the white nor the clear green PLA are really good. I'm still hoping to get slightly better effects with colored opaque PLA. The 2D stand-up ones you need to cut out in shape are actually a lot of work, and are hard to see from the side. I used flat 2D ones before, but the 3D miniatures are easier to see across the table. I guess sceletons don't have it any better than us human Sararimen, taking public transportation to work. Those prints look typical of a printer that just needs setting up correctly or a of a printer requiring some modification. Look at the following youtube, his printer is showing in the beginning is showing results similar to your own, after a few changes his prints are completely different.